Why put titles on if no-one can see them? Titles on the slide are not just words on the page, they are also used internally to identify the slides. The titles are used in various places and are really quite an important part of each slide. I’ll cover the most important reasons why I think you should always have a title on every slide and then look at best approaches to do this. From time to time you will need to navigate around in your presentation while presenting it – maybe you are running short of time and need to skip ahead, or a question at the end makes you want to go back and show a particular slide again to explain the answer. Either way, the simplest way to do this if from the right click menu > Go To Slide > then choose where you need to go. Doing this by slide number alone is a nightmare, so make sure all of your slides have titles that make sense to you in this list. Now, I know not everyone uses the feature to create custom shows, so a quick explanation may be needed. When you present normally, you will see every slide in the presentation (except for hidden ones). You might have to maintain several versions of a presentation – perhaps for occasions where you are given more or less time to cover the subject, so you can’t always get into the depth and detail you want to. Or perhaps you have some general slides about your offering, but then a selection of case studies which you would select from according to your audience so you know you are talking about something interesting to them specifically. This is what custom shows are for – you can select a subset of your slides, and/or change the order they are shown in, and save that as a ‘version’ of your presentation – within a single PowerPoint file (pptx or ppt – this feature was available in 2003 as well). So you might have a 10 minute version and a full half hour (especially if you are following the Beyond Bullet Points methodology), or one version for investors and one for potential customers, or several for customers in different industries. All in one file. That way, if you update slide 17 with the latest financial results, or alter the picture on slide 23 with a better photograph of your headquarters, you don’t have to go and edit lots of different slide decks, you just edit it once and every one of your custom shows will use the new version (if it is included in that show of course). So what does this have to do with titles? Well, just like when you are using that right-click to jump to a different part of your presentation, when you are building a new show or editing an existing one you get a list of slides by number, with their titles next to them. Seeing “37. Slide 37” is really not very helpful, and it is even worse with custom shows, because the slide numbers in the show itself are different from in the ‘master’ file – they are in the order they appear in that show. So slide 37 might be slide 15 in one show and slide 18 in another, so now it is even harder to keep track of which one is which unless you have used proper titles on every slide. In the screenshot below you can see that I have chose some of the slides from the left, but in a different order, and it would be quickly confusing as to which slide had what picture on (or whatever content it contains). When you use Outline view to help you plan and reorganise your presentation, this shows titles of slides, even if (you guessed it) they are not visible. If you don’t have a title at all and there are no other words on the slide (as in the sort of case we are talking about with large pictures), you see nothing here at all, just a blank line next to the slide number. If you have a need to publish your presentation out to a web page, the titles of your slides will be used for the outline pane presented to the viewer for navigation, even if they would not be visible on the slides. 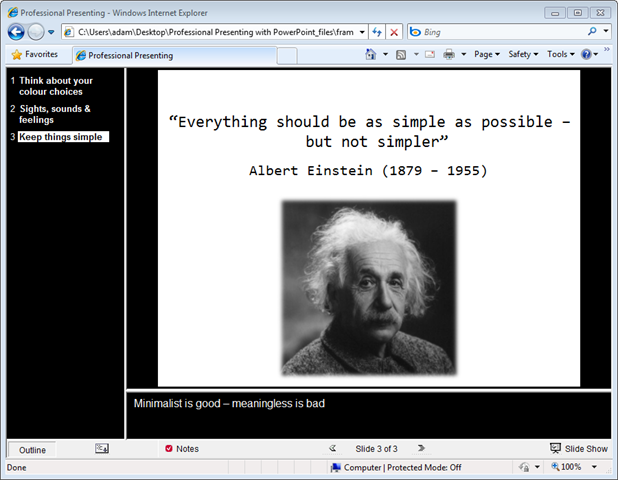 In the short section of a recent training course presentation I have published and then viewed in Internet Explorer here, you can see the third slide has a title which makes sense for navigation (“Keep things simple”) rather than describing what is on the page (“Albert Einstein” would be a rather odd entry in the menu here). Omitting the title would have left a blank entry, which is not helping the audience at all. This is a bit more obscure, but I find it useful when presenting lots of slides with images and little text. Imagine you are presenting to an audience, and in the “filmstrip” at the bottom of presenter view you see the next slide coming up and you get a mental block what the main point for that slide is. Total brainfreeze! You know the notes will remind you, but you don’t want to have to wait for the slide to appear then have to read before you can start talking. Also, you might want to segue smoothly from one topic to the next so you need to know where you are headed. The same applies if you are trying to look ahead for a particular point that you can jump to so you can skip a few slides. Right click> go to slide is OK, but even easier is just to hover over the thumbnail view of the slide. The title will popup in a little tooltip and you can be reminded of what your main point was, and the picture that goes with it (whereas the right click has the title only). The simplest way by far is to move the title placeholder so it is not within the area of the slide. In fact, when I design corporate slide templates and themes for clients I always include a layout which has a bare slide (great for pictures) with a title placeholder already just off the top of the slide, called something like “Blank slide with hidden title”. Alternatively, if you using the layout for “title only” from one of the built-in templates or your own company theme you could add a picture to cover the whole slide which you show while you are talking about that particular topic. This might be a simple photograph of a box shot of your new product, an image of your new widget being used by some hip individuals in a trendy studio apartment (what I call lifestyle’ shots), a screenshot of your software in action, or a portrait of someone or something relevant to the subject, or even something more abstract. In PowerPoint 2007 if you insert a picture on a blank slide it will fill the whole slide as best it can, and you can adjust the size as discussed in my earlier post and on Jan Shultink’s Slides That Stick blog. By default in 2007 the picture will be in the foreground, with the title hidden behind it, which might be sufficient as long as you are not intending to have the picture appear in some way other than all at once when the slide is shown (so not fading in for example). While it is nice and invisible behind the picture, it is not very helpful when it comes to editing it, so it is probably best to move it anyway. Using the mouse, drag a selection rectangle over the area of the slide where the title is. To make sure you don’t accidentally select and drag the picture, start the rectangle outside the slide itself, in the blank area of screen around it. Turn on the selection pane. The button for this is in a couple of places. Home ribbon > Drawing group > Arrange > Selection pane or if you have the picture selected Picture Tools|Format > Arrange group > Selection pane. Every object on the slide will have a little “eye” icon next to it. If you deselect the one next to the picture object, it will become invisible and impossible to select, so now you can get at the title box and edit it. Again, I would still say you are best to move it so you don’t have to do this every time you want to see what it says. Don’t forget to click on the eye to make your picture visible again (more on that later). There are a couple of other things to bear in mind when doing this. The slide master you are using may have the title set up so that it builds as part of the slide, for example fading in or having the text appear from one side, then waiting for you to click the mouse before going on to the next item. I’m not going to get into a discussion here as to whether that is a good or bad thing, just to note that if you have a title that is not visible and it is then waiting for you, the audience sees a blank slide until you realise what is going on and catch up with them. To avoid this, make sure you check the custom animation for the slide and ensure that there is no animation event for the title (in the custom animation pane you will see the effects applied in the slide master slightly greyed out. Right click and “copy effects to slide” then you can remove the ones you don’t need. All of this is a good reason to have a specific slide master in your template which includes the title off the slide, and has no animation for the title, even if your other slide layouts do. One of the other methods you will sometimes see people using or proposing to hide their slide titles is to simply hide the title while leaving it in it’s original place. If you look back at the method for getting at a title behind a picture, you will remember the option of using the selection pane to hide an object so that you can see behind it. Well, you could also use that to simply hide something forever – like a title, say. This would mean it does not show up when you run the show (except in the tooltip if you hover on the thumbnail in presenter view) and you don’t have to worry about animation either. Quick and easy, so why should you not do this? Firstly, backwards compatibility. If you are sharing the presentation with someone using PowerPoint 2003, they cannot use selection pane to get the title back. They can however see it in outline view, but you might be amazed how many people I do advanced PowerPoint training for who have never used outline to organise and plan their presentation, or do not even know of its existence. These people would not know how to change the title, which may not seem too bad until they duplicate that slide (perhaps to add different captions or some other content) and now they have multiple slides with the same title and can’t edit them. So the first problem is your colleague may not know how to see it, the second problem is that your customer might, and if you had a slide called “How we get more money out of our customers” then it might not be good to leave that title in. So along comes the document inspector. Using this feature in Office 2007 helps you to identify and clean up this kind of invisible content. Go to Office button > Prepare > Inspect document > pick some options (or all of them for good measure), find ‘dangerous’ stuff and get rid of it. Oops. That title of yours is toast, as it gets classed as “invisible content” and removed (if you tell it to remove the things it finds, obviously you can be a bit more careful and choose not to). So hiding it is OK, but you or someone else could remove it by accident, thinking you are doing something helpful. To avoid this, simply don’t hide the title, move it off the slide as a recommended earlier. Hang on a minute though, one of the options in the document inspector is to find and remove “off-slide content”. Surely this is no better? Well, even if you choose the option to find (then later remove) off-slide content, the title placeholder is specifically ignored and left alone. The same is not true of any other text box you add, nor the original content placeholders if you moved them off the page. See, I told you titles were special. Just passing through–this post answered a couple questions for me. Thanks! So when slide material continues to the next 1 or 2 slides, do you put (cont.) after your title, or prefer a “-2” or “-3”? And I’ve seen superscripts which look totally wrong! But let’s say I want to present some data in a visual way, using a chart. And maybe I want to build this up to tell a story. Possibly show the market change from last year to this year, then show our figures for last year and discuss some key points, then show this year’s sales and discuss how that compares to market average. This is arguably three ideas and could make more sense to split across three slides rather than having a single chart with various bits animated to appear over the top. Keeping the three slides separate also makes printed or pdf versions more readable and consistent with what was presented. But this is three ideas again now, so would probably have three different titles. These could be “Sales FY11 vs 12: Whole Market”, “Sales FY11 vs 12: Our widgets last year”, “Sales FY11 vs 12: Our success this year”. I might do some sneaky things where I want to do a lot of animation on a slide (ie building in stages, not necessarily stuff moving) but again want to improve the handout or simply make it easier to manage and edit. I might do half the build, then a non-visible transition to a matching slide which has none of the early bits on, then add the later build stuff. So this is effectively one slide split in half. Maybe I would use a “-2” or something, but again the first half probably builds up to a punchline which is why it was natural to split it there. So this might lead to a better title anyway – “Social media – the story so far”, “Social media – the next ten years” for example, even though it looks like a single slide with various changes going on to the audience. Thanks! I looked all over for those little eyes – which I discovered during a session in which I was trying to figure out how to hide titles on the slide but keep them in the outline. So happy to find them again!